DEVA Nutrition Essential Fatty Acids - Vegan Chia Seed Oil - 90 Vegan. 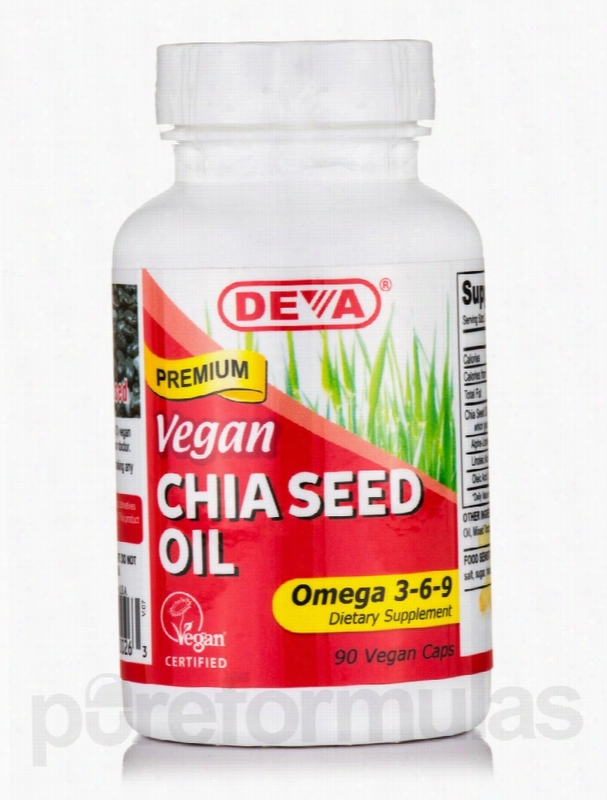 Vegan Chia Seed Oil Vegan Capsules from DEVA&reg; Nutrition may potentially enhance your intake of essential omega-3 fatty acids&sbquo; and boost heart and eye health. Chia seed oil is a natural vegan food&sbquo; which may possess significant nutritive value. It appears to be a rich vegan source for the essential omega-3 fatty acid ALA (alpha linolenic acid). This dietary supplement from DEVA&reg; Nutrition could boost your immune system and reduce inflammation in the body. Chia seed oil may potentially help build muscle&sbquo; aid digestion and enhance the absorption of fat soluble vitamins like vitamins A&sbquo; K&sbquo; D and E. Scientists claim that Omega-3 fatty acids found in Chia seed oil may aid respiratory system and oxygen transport. This nutrient may also help in lubrication of the body&rsquo;s cells and formation of cell membrane. Studies reveal that Chia seed oil could help the function of thyroid and adrenal glands. It may also supply nutrition to the skin&sbquo; mucus membrane and nerves. Studies reveal that Chia seed oil may play a key role in the metabolism of calcium and phosphorus. Vegan Chia Seed Oil Vegan Capsules from DEVA&reg; Nutrition could help restore nutritional balance derived from essential fatty acids. These statements have not been evaluated by the Food and Drug Administration (FDA). These products are not meant to diagnoseÃ¢ÂÂ treat or cure any disease or medical condition. Please consult your doctor before starting any exercise or nutritional supplement program or before using these or any product during pregnancy or if you have a serious medical condition. DEVA Nutrition Gastrointestinal/Digestive - Vegan Colon Cleanse 600 mg.
Vegan Colon Cleanse Tablets from DEVA&reg; Nutrition is a blend of herbs and fiber that may help in cleansing the colon. Many people believe that undigested food causes mucus to build up in the colon. This could lead to fatigue and low energy levels. This dietary supplement from DEVA&reg; Nutrition contains the dried bark of the shrub Cascara. Researchers claim that cascara contains chemicals that may stimulate the bowel and cleanse it. This supplement includes Aloe Vera&sbquo; a succulent plant of the lily family. Studies reveal that Aloe Vera could act as a laxative&sbquo; and may help soothe digestive conditions. Triphal&sbquo; a herbal formula has been reported to relieve constipation and potentially aid in colon cleansing. This dietary supplement from DEVA&reg; Nutrition also contains psyllium husk. The tiny seeds and husk of the Psyllium plant are rich in fiber and appear to help in cleansing the colon. 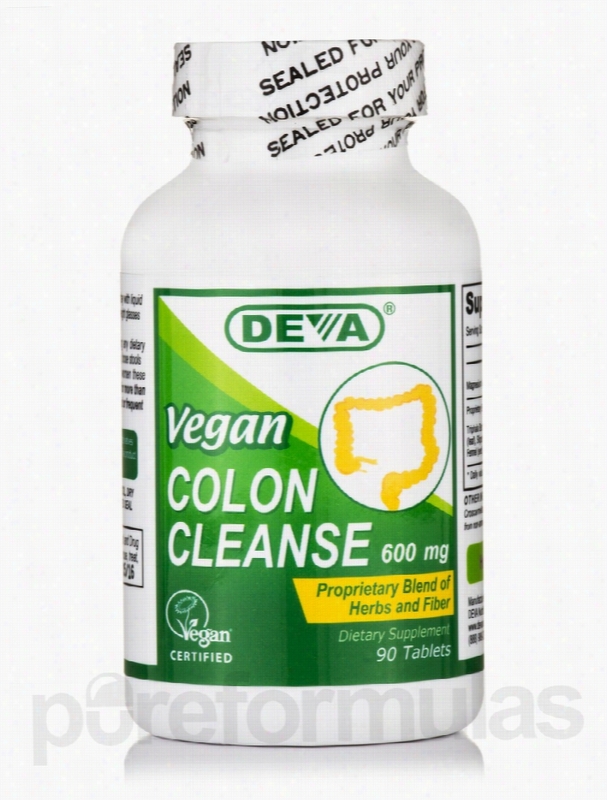 Get Vegan Colon Cleanse Tablets from DEVA&reg; Nutrition today&sbquo; which could cleanse the colon and possibly relieve constipation. These statements have not been evaluated by the Food and Drug Administration (FDA). These products are not meant to diagnoseÃ¢ÂÂ treat or cure any disease or medical condition. Please consult your doctor before starting any exercise or nutritional supplement program or before using these or any product during pregnancy or if you have a serious medical condition. Bauman Nutrition Protein - Vital Scoop Energy Shake Vanilla - 64 oz. If you&rsquo;re looking for a natural powdered drink mix&sbquo; you might want to try Bauman Nutrition&rsquo;s Vital Scoop Energy Shake Vanilla. This low-calorie powdered whey protein supplement has a balanced macronutrient profile: each serving consists of 45 percent protein&sbquo; 30 percent carbohydrates&sbquo; and 25 percent fat. At the same time&sbquo; this product may offer a mild energy boost without common stimulants. Vital Scoop Energy Shake Vanilla may also have a mild detoxifying effect because every scoop contains greens and fruit extracts with high ORAC values; ORAC (Oxygen Radical Absorbance Capacity) measures ingredients&rsquo; potential ability to fight off harmful free radicals. Last&sbquo; Vital Scoop Energy Shake Vanilla contains flaxseed&sbquo; which provides fiber and essential omega-3 fatty acids. Fiber might help you feel full while playing a role in maintaining proper digestion&sbquo; whereas omega-3s may work to support cognitive function and alleviate certain symptoms associated with mild inflammation. 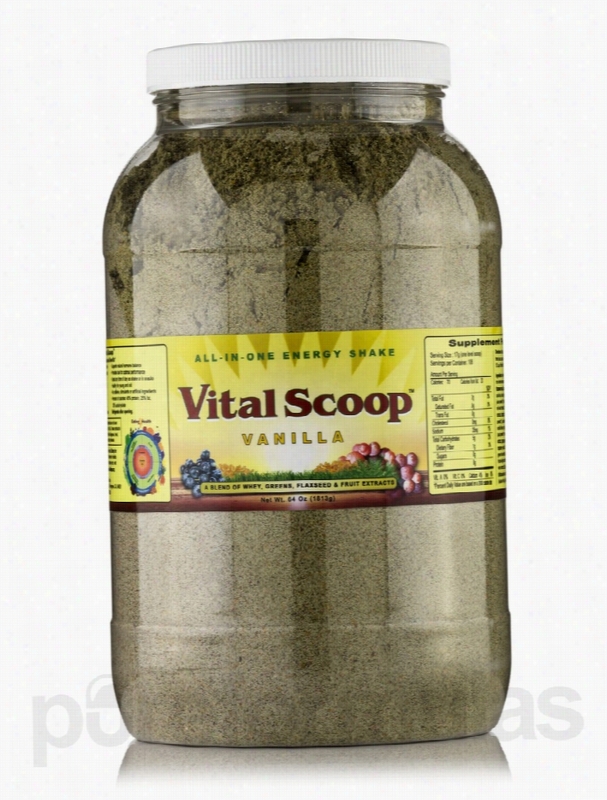 Every four-pound (64-ounce) Container of Vital Scoop Energy Shake Vanilla by Bauman Nutrition supplies over 100 servings. These statements have not been evaluated by the Food and Drug Administration (FDA). These products are not meant to diagnoseÃ¢ÂÂ treat or cure any disease or medical condition. Please consult your doctor before starting any exercise or nutritional supplement program or before using these or any product during pregnancy or if you have a serious medical condition. 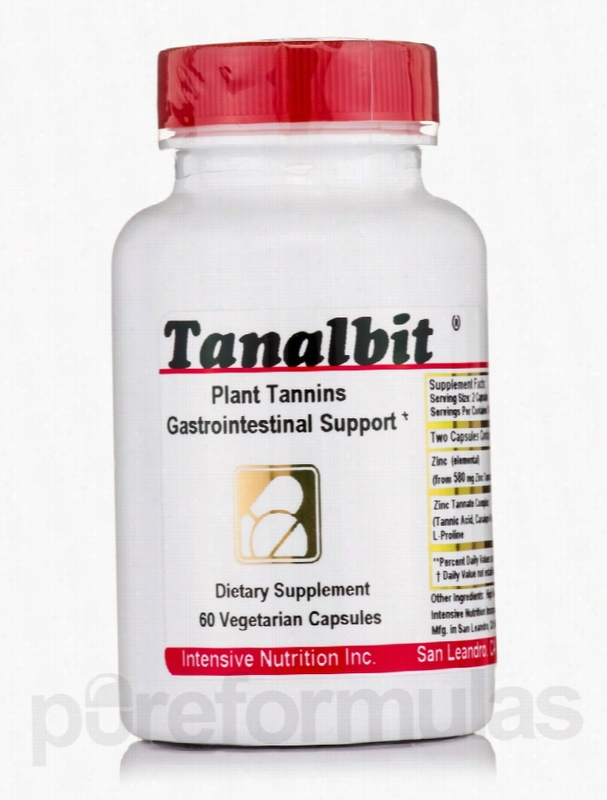 Intensive Nutrition Gastrointestinal/Digestive - Tanalbit - 60. Your large intestine harbors a lot of bacteria on a regular basis. Some of these bacteria are beneficial&sbquo; while some can cause uncomfortable infections. Your large intestine can also become infected by large amounts of yeast and other potentially harmful fungi. These types of infections may end up causing diarrhea. You can sometimes find relief by taking antibiotics or anti-fungal medications prescribed by your doctor; for mild relief&sbquo; talk to your doctor about taking a supplement that contains tannins&sbquo; like Intensive Nutrition&rsquo;s Tanalbit&reg;. Tannins are substances that come from plants that may help clear up infections and ease diarrhea symptoms. Tanalbit&reg; provides you with a healthy dose of tannins&sbquo; nutrients&sbquo; and other natural ingredients to help fight bacterial and fungal infections. It might help relieve symptoms of intestinal infections&sbquo; such as diarrhea. It works by latching onto bacteria and fungi in order to stop them from colonizing in your intestine; instead&sbquo; they die off. Tanalbit&reg; may help alleviate occasional or persistent discomfort&sbquo; but shouldn&rsquo;t be used as a substitute for any medications prescribed by your doctor. The active ingredients in each vegetarian capsule include: Zinc tannates&mdash;to help remove bacteria and fungi from large intestine and relieve diarrhea Casein (derived from milk)&mdash;to help move Tanalbit&reg; into your lower gastrointestinal tract L-Proline&mdash;an amino acid that may boost energy levels and help your body produce collagen&sbquo; the protein that connective tissues are made of Lotus rhizome&mdash;to help relieve diarrhea by tightening up body tissue One bottle of Tanalbit&reg; by Intensive Nutrition contains 60 tablets&sbquo; which should last between seven to 10 days&sbquo; depending on your dosage. Take two to three tablets three times daily&sbquo; unless otherwise directed by your doctor. For best results&sbquo; take these tablets 30 minutes to one hour before meals&sbquo; or with a small snack. Intensive Nutrition was founded in 1968 to provide unique&sbquo; effective supplements with formulas backed by science. Most of its products are certified Kosher&sbquo; and all are highly bioavailable for the maximum benefit. These statements have not been evaluated by the Food and Drug Administration (FDA). These products are not meant to diagnoseÃ¢ÂÂ treat or cure any disease or medical condition. Please consult your doctor before starting any exercise or nutritional supplement program or before using these or any product during pregnancy or if you have a serious medical condition. Intensive Nutrition Cellular Support - R-Lipoic Acid 50 mg - 60. Your body is made up of millions of cells that provide structure and function. If you maintain good cellular Health&sbquo; you may be able to avoid illness and maintain overall physical wellbeing. By providing proper nutrients to nourish your cells&sbquo; you can keep your cells healthy and able to produce energy. A good diet can provide vitamins&sbquo; minerals&sbquo; amino acids&sbquo; and other essential cell nutrients. Although cellular dysfunction can be caused by poor nutrition&sbquo; cellular health is also threatened by free radicals. Free radicals are chemicals that are produced through the normal metabolic breakdown of food&sbquo; as well as by exposure to toxins&sbquo; the sun&sbquo; and other substances. They may cause cell oxidation damage&sbquo; which in turn causes illness and is the primary factor in the appearance of aging. Antioxidants can inhibit the negative consequences of free radicals and protect your cells from damage. The R form of alpha-lipoic acid is a powerful antioxidant that may help delay cellular aging&sbquo; and boost brain functioning. Intensive Nutrition&rsquo;s R-Lipoic Acid 50 mg interacts with antioxidants such as vitamin E&sbquo; vitamin C&sbquo; and glutathione peroxidase to help your cells maintain adequate levels of these chemicals. This supplement provides a natural form of alpha-lipoic acid that&rsquo;s 100% biologically active; this means that your body is able to synthesize and absorb it easily. It can promote antioxidant lipoic acid production&sbquo; aiding in cellular metabolism and fighting free radicals. R-Lipoic Acid may also provide additional health benefits: these include improved skin health&sbquo; enhanced vitality&sbquo; and reduced inflammation. 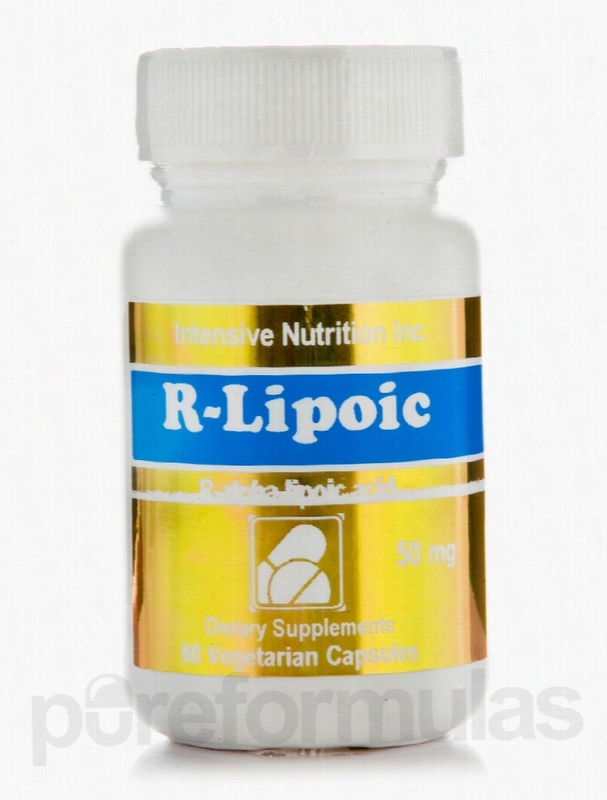 R-Lipoic Acid 50 mg is a vegetarian supplement free of artificial colors or preservatives. In addition&sbquo; it doesn&rsquo;t contain any common allergens like yeast&sbquo; soy&sbquo; egg&sbquo; gluten&sbquo; or wheat. Each capsule provides 50 mg of essential R-Alpha-Lipoic Acid&sbquo; along with inert cellulose powder fillers. When taken at the recommended dosage&sbquo; each 60-capsule bottle of R-Lipoic Acid by Intensive Nutrition should last you for up to two months. Intensive Nutrition was founded in 1968 to provide unique&sbquo; effective supplements with formulas backed by science. Most of its products are certified Kosher&sbquo; and all are highly bioavailable for the maximum benefit. These statements have not been evaluated by the Food and Drug Administration (FDA). These products are not meant to diagnoseÃ¢ÂÂ treat or cure any disease or medical condition. Please consult your doctor before starting any exercise or nutritional supplement program or before using these or any product during pregnancy or if you have a serious medical condition. DEVA Nutrition Cellular Support - Vegan Astaxanthin 4 mg - 30 Vegan. Astaxanthin 4 mg Vegan Capsules from DEVA&reg; Nutrition may help support eye and brain Health naturally. Astaxanthin is a reddish pigment that belongs to the carotenoid group of chemicals and is believed to possess antioxidant properties. This dietary supplement from DEVA&reg; Nutrition contains extracts from natural sources of Astaxanthin and is manufactured from the microalgae Haematococcus pluvialis. Carotenoids are natural compounds which are produced by plants. Studies reveal that Astaxanthin may have more antioxidant properties than most other antioxidants. Astaxanthin has been found to freely cross the blood-brain and blood-retina barriers&sbquo; which may help in neutralizing free radicals of the brain and retina. This could potentially provide valuable support for both eye and brain. This dietary supplement from DEVA&reg; Nutrition may also improve some areas of cardiovascular health. This dietary supplement from DEVA&reg; Nutrition is free from glutens&sbquo; GMO&sbquo; hexane&sbquo; sodium&sbquo; soy&sbquo; sugar&sbquo; wheat &amp; yeast. 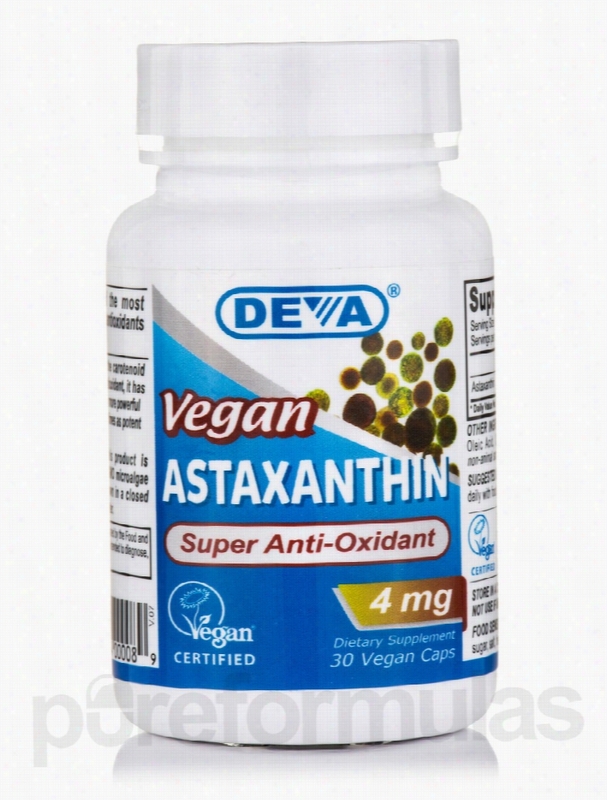 The antioxidant capacity of Vegan Astaxanthin 4 mg Vegan Capsules may help you lead a healthier life. These statements have not been evaluated by the Food and Drug Administration (FDA). These products are not meant to diagnoseÃ¢ÂÂ treat or cure any disease or medical condition. Please consult your doctor before starting any exercise or nutritional supplement program or before using these or any product during pregnancy or if you have a serious medical condition. DEVA Nutrition Gastrointestinal/Digestive - Vegan Digestive Support -. 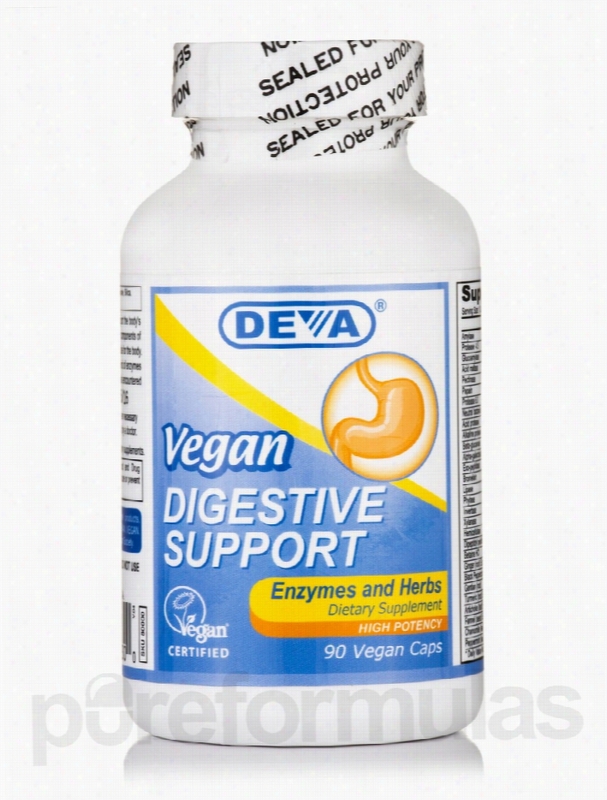 Vegan Digestive Support 90 Vegan Capsules from DEVA&reg; Nutrition helps support digestion with its unique blend of enzymes and herbs. It has been reported that poor dietary choices could lead to a host of conditions&sbquo; which could range from a weakened immune system to chronic health issues. Our modern lifestyle exposes us to an excess of sugar&sbquo; fat and processed food every year. This vegan supplement from DEVA&reg; Nutrition could help provide the required nutritional support by breaking down food into its usable form. Digestive enzymes are proteins that help break down food into smaller building blocks. It has been reported that with age&sbquo; our bodies produce fewer enzymes which may make our food less nutritious. Amylase present in this supplement is an enzyme that could help in the digestion of carbohydrates&sbquo; while protease could facilitate protein digestion. It is believed that ginger&sbquo; valued by traditional healers&sbquo; may also enhance digestive function. This supplement also contains turmeric&sbquo; which may help reduce inflammation and possibly support the digestive system. This product from DEVA&reg; Nutrition is free of gluten&sbquo; GMO&sbquo; milk&sbquo; salt&sbquo; soy&sbquo; starch&sbquo; sugar&sbquo; yeast&sbquo; wheat. Switch to a healthier lifestyle with Vegan Digestive Support 90 Vegan Capsules from DEVA&reg; Nutrition. These statements have not been evaluated by the Food and Drug Administration (FDA). These Products are not meant to diagnoseÃ¢ÂÂ treat or cure any disease or medical condition. Please consult your doctor before starting any exercise or nutritional supplement program or before using these or any product during pregnancy or if you have a serious medical condition. DEVA Nutrition Essential Fatty Acids - Vegan Flax Seed Oil - 90 Vegan. 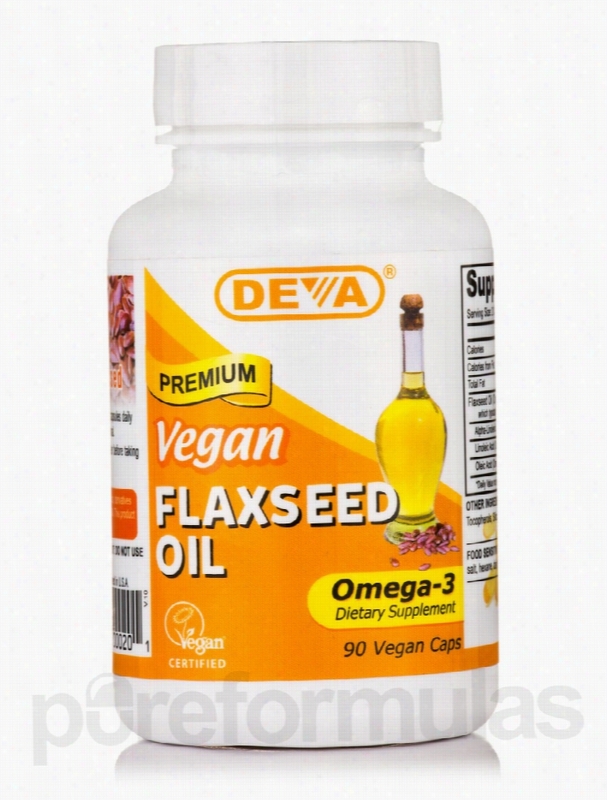 Vegan Flax Seed Oil 1000 mg Vegan Capsules from DEVA&reg; Nutrition may be just the right supplement for increasing your intake of essential fatty acids. Flax seed have been cultivated for thousands of years. They appear to be a good source of omega-3 fatty acids. Studies reveal that omega-3 fatty acids may promote the function of the brain&sbquo; joint and cardiovascular health. These essential acids are often missing from the Western diet. This vegan capsule DEVA&reg; Nutrition also contains omega-6 fatty acids (linoleic acid) and omega-9 fatty acids (oleic acid). It has been reported that prostaglandins&sbquo; that are derived from fatty acids have many functions in the body. Vegan capsules could potentially maintain the body&rsquo;s natural balance of good and bad prostaglandins. The Vegan Flax Seed Oil 1000 mg Vegan Capsules could provide you with the right balance of essential fatty acids in your diet. Switch to a healthier supplement with Vegan Flax Seed Oil 1000 mg Vegan Capsules from DEVA&reg; Nutrition by your side. These statements have not been evaluated by the Food and Drug Administration (FDA). These products are not meant to diagnoseÃ¢ÂÂ treat or cure any disease or medical condition. Please consult your doctor before starting any exercise or nutritional supplement program or before using these or any product during pregnancy or if you have a serious medical condition. Intensive Nutrition Skin Care - DMAE 3% Anti-Aging Gel - 1 oz (30 ml). 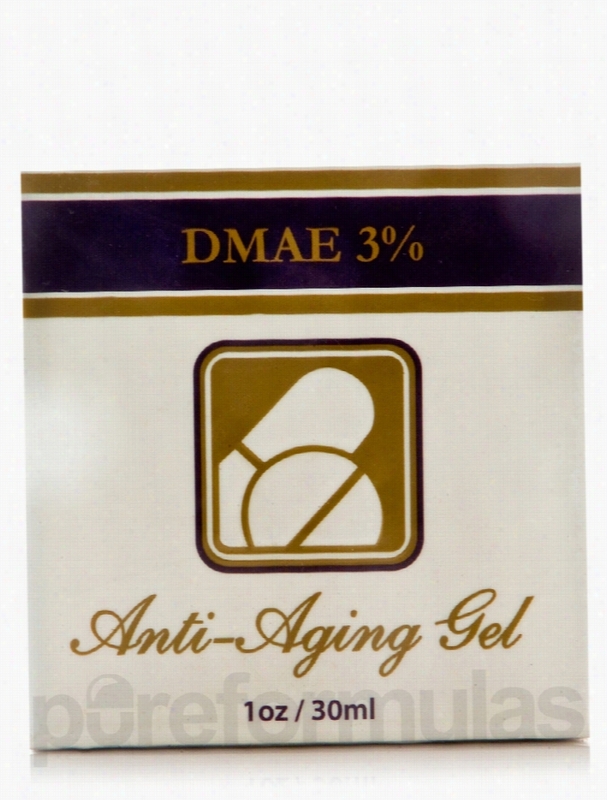 DMAE Amine Topical Crystal Gel for skin health and youthful appearance! Paraben-free. Can be applied directly to face and can also use on hands and other areas that show signs of aging. What is DMAE?DMAE is described as a &quot;vitamer&quot; and is believed to help improve memory and brain function by increasing levels of the brain neurotransmitter acetylcholine. Acetylcholine is broken down into choline &sbquo; a b vitamin that has many benefits. Our DMAE topical contains DMAE in its AMINE form. This is the ONLY form of DMAE that is absorbed by the skin. If you are using DMAE bitartrate or are making your own DMAE solution&sbquo; you are not using the right DMAE product. In addition&sbquo; Intensive Nutrition's professional quality DMAE topical formulas contain the highest percentage of DMAE. Many other formulas that contain DMAE amine only do so in small amounts and as a consequence do not list the percentage in the product description. How does DMAE Amine positively affect the skin's appearance? Acetylcholine is involved to a certain degree with muscle contractions. Application of DMAE for skin may help prevent sagging skin and increase firmness. Our results indicate and after a nightly application of DMAE&sbquo; skin does appear firmer and tighter. Puffiness is reduced. These statements have not been evaluated by the Food and Drug Administration (FDA). These products are not meant to diagnoseÃ¢ÂÂ treat or cure any disease or medical condition. Please consult your doctor before starting any exercise or Nutritional supplement program or before using these or any product during pregnancy or if you have a serious medical condition. Intensive Nutrition Cardiovascular Support - Folixor Sublingual Folic. What does Folic Acid do?Folic Acid is B Vitamin and functions in a fashion similar to that of Vitamin B12. It aids in red blood cell production&sbquo; and helps break-down and utilize protein. It is essential for DNA &amp; RNA synthesis and thus important for healthy cell division and replication. For expectant mothers&sbquo; it helps prevent neural tube defects*. Folic Acid helps to protect us from heart disease* because it helps to reduce concentration of artery clogging amino acid&sbquo; homocysteine. It works synergistically with B12.Who should consider this formula? Folic Acid supplementation is essential for all women of child bearing age. It supports heart health as an antagonist to artery-clogging amino acid&sbquo; homocysteine. Folic Acid may have additional applications for: cervical health&sbquo; mental health/acuity&sbquo; oral hygiene.Why is Folixor&reg; a better folic acid supplement? Intensive Nutrition's Folixor&reg; formulas are under-the-tongue&sbquo; meaning that they are absorbed bucally. Generally&sbquo; buccal absorption is superior because it ensures maximum absorption. 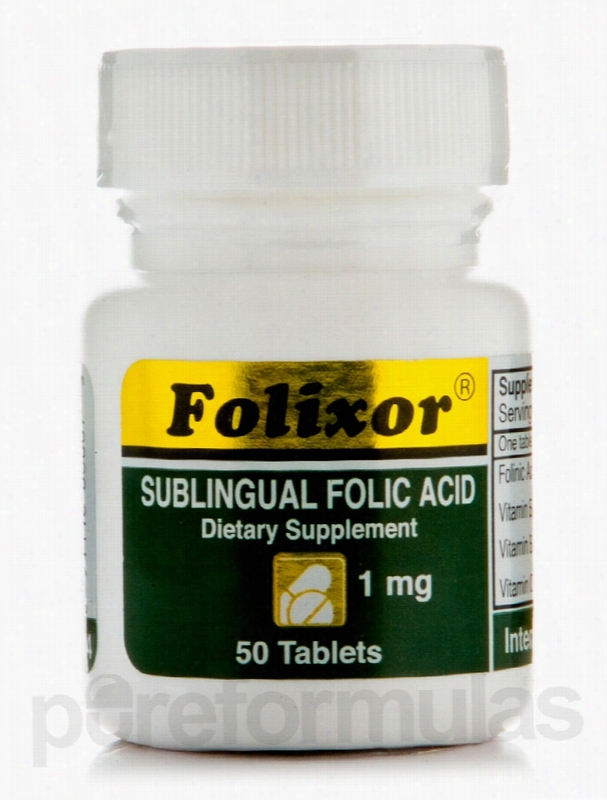 Folixor&reg; also contains folinic acid&sbquo; the &ldquo;body ready&rdquo; form of folic acid which means that it is more bioavailable or better absorbed than basic folate. Folixor&reg; contains adjuvants Vitamin C&sbquo; Vitamin B12 and Leucine which support folate activity.What about 5-methyl-tetrahydrofolate? Why is this not in Folixor&reg;? Methyl-tetrahydrofolate is the most bioavailable form of folate&sbquo; however&sbquo; there are several studies which indicate that the action of 5-methyl-tetrahydrofolate is not superior to that of folic acid&sbquo; in fact they seem to work just as well as each other. In addition&sbquo; certain genotypes seem to prefer folic acid to methyl. As folic acid and folinic is considerably less expensive than 5-methyl but just as if not more effective when delivered bucally&sbquo; we therefore use folic acid and folinic acid to make Folixor&reg; cost-effective and affordable for our customers. These statements have not been evaluated by the Food and Drug Administration (FDA). These Products are not meant to diagnoseÃ¢ÂÂ treat or cure any disease or medical condition. Please consult your doctor before starting any exercise or nutritional supplement program or before using these or any product during pregnancy or if you have a serious medical condition.